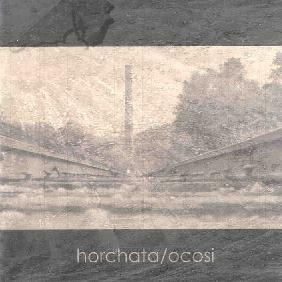 Horchata is Mike Palace and Ocosi is Paul Molyneux/Simon Smerdon, and their first collaboration is a solid slab of trip-hop. There are some really strong down-tempo grooves here, embellished by the usual loops and psychedelic effects. The release is not extraordinarily unique, but it often hits the right spot. For instance, opening cut "Slipping Away" has an irresistably heavy dub-beat, embellished with some krauty, almost-Cluster like harmonic guitar-effects. But "Quinta" is too cliche in its simplistic use of typically 3-note electronica-type rhythmic loops, something to be found on almost any average college-electronica disc. "Something for Nothing" is a stand-out song, partly because of its bizarre and obtrusive "plonk-plonk!" effect punctuating the beat, which alternates with a swifter more up-tempo electro boom-booming rhythm. "Spoo CC" is a very creepy sci-fi space-hop freak-out, featuring the most spacious keyboards of the whole album, whose oscillations manage to cover most nooks and crannies of all the cosmos. "Transfiguration" calls attention to itself by virtue of combining a groovy creepy-crawly dub-hop beat and impressive avant-garde percussive dynamics which sound like an unlikely harmonious agreement between two persons playing the triangle, in my experience comparable to Mirza's "Feeding the Sepent from a Cup". But then "Metamorphic" is pretty much expendable, the beat, keys and loops not at all unique or inspiring. This is merely a tune that would have been left off a vinyl LP. "Hedlam" is a step up from there with a monotonous beat that gets progressively infectious before you realize it, assertive and grumbling, with short breaks before silly simplistic cartoon-keyboard comes back to haunt, ending with a "glitchy" CD-skip effect... though the track altogether is a bit too lengthy. "Handshake" is a very respectable work, forsaking the overt beat for a percussive yet more obscure avant electro-acoustic nightmare scape. These blokes have a second album to be imminently released so let's hope they can make an even better follow-up.